When Denise Eliopulos called me and said she was working on something great and wanted me to be a part of it, I already knew my answer would be “yes” without even knowing what she would ask of me. I have known Denise for 20 years. 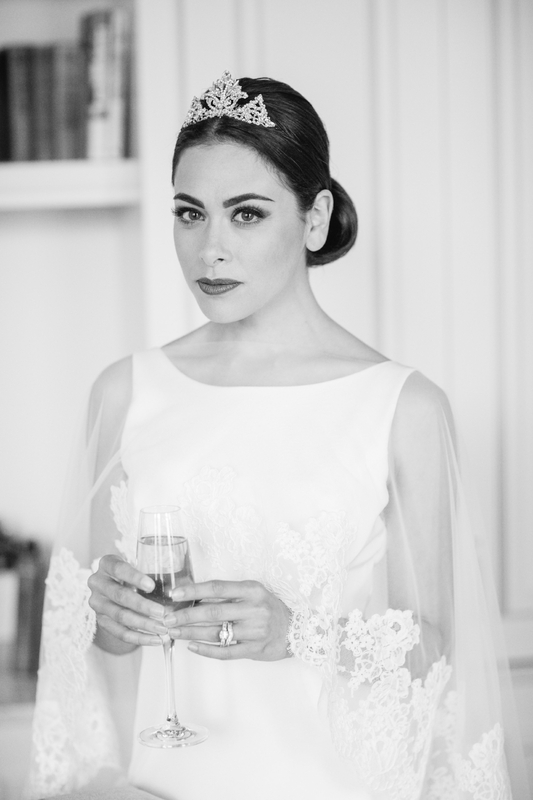 She is Creative Director for Something Bleu Bridal and respected as a trailblazer in the world of women’s fashion. Denise has an adept ability to put together a fashion story in her mind, and on a woman’s body. What I love about working with her, is that she isn’t merely a bridal merchandiser; she is a visionary. Denise called me at the shop and revealed her vision for what would be the most incredible styled shoot in all of her 37 years in the fashion world. The shoot would center around Hollywood star and fashion icon, Audrey Hepburn, and the historic Adelphi Hotel in Saratoga Springs, NY. Finding the right model was key. Nina Jade has been a professional model for eight years. Classic, modern, and chic best describe Nina’s expression for fashion. Outside of modeling, Nina enjoys a style is that is simple with a comfortable, relaxed twist. Nina has over 30K followers on Instagram who can instantaneously catch a glimpse of her world travels while modeling. Her most recent modeling campaigns include Origins, Wander Beauty, and Color Wow Hair. Denise knew Nina Jade would be perfect to play the part of Audrey Hepburn. Nina’s striking resemblance to Audrey Hepburn was never apparent to her. She has always been drawn to Audrey and the period of old school Hollywood glamour. At the beginning of the photo shoot, Saratoga Springs based make-up artist Alayne Curtiss and owner of Make Me Fabulous, added clip in bangs to Nina’s hair. That’s when Nina began to realize she was stepping into more than a modeling role. It was her job to portray Audrey as she was during the 1950’s and 60’s at the peak of her motion picture career. Alayne Curtiss is well known in the beauty industry. As the owner of Make Me Fabulous since 1997, her work has been featured in Martha Stewart, Glamour, Women’s Day, Self, The Knot, In Style Hair, and Well Wed. She is in the final stages of launching her own bridal cosmetics line to share with all who want to look fabulous. Alayne’s flawless technique prepared Nina for the camera with perfection. 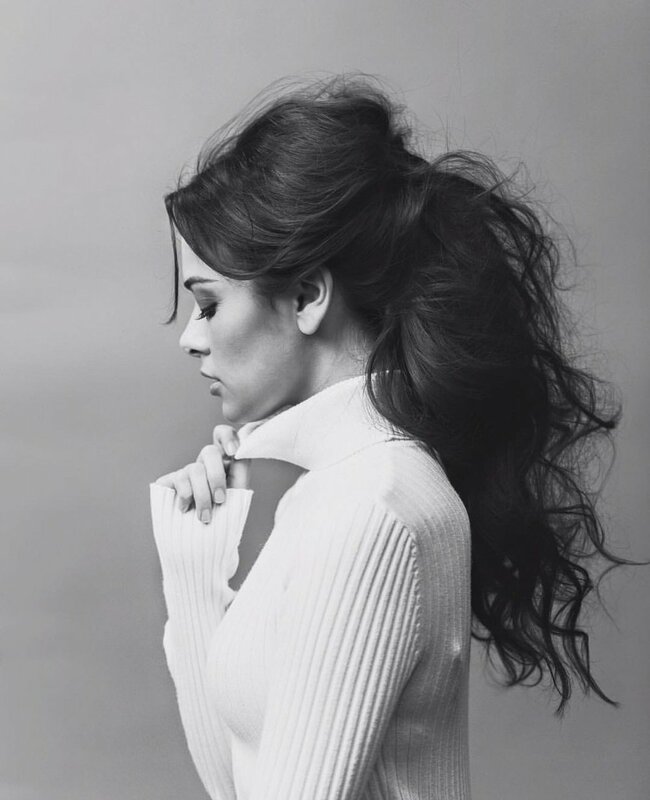 Denise chose award-winning photographer Tracey Buyce to capture the essence of modern-day Audrey Hepburn. Tracey is a passionate photographer who finds no limits behind her lens. Her photography is bolstered by a strong foundation of family… and her love of animals. In addition to shooting weddings and portraits, she is accomplished at equestrian photography. Photographer Tracey Buyce and her pup, Roxy. Tracey’s Instagram feed is full of all kinds of love. The Adelphi Hotel located on Broadway in Saratoga Springs, NY was known as a landmark and the centerpiece of downtown since 1877. The Adelphi is a 19th century grand hotel and one of the last of its kind. In the fall of 2012, the Adelphi closed for a short eight month renovation, but after opening the walls its history revealed restoring it back to its grandness would take more time. After its grand re-opening in late 2017, the Adelphi became the setting for what many deemed as an epic photo shoot. Nina Jade is relaxed and ready to shoot on the steps of the Adelphi Hotel in her comfy smoking slippers by Birdies of San Francisco, also a favorite of Meghan Markle. 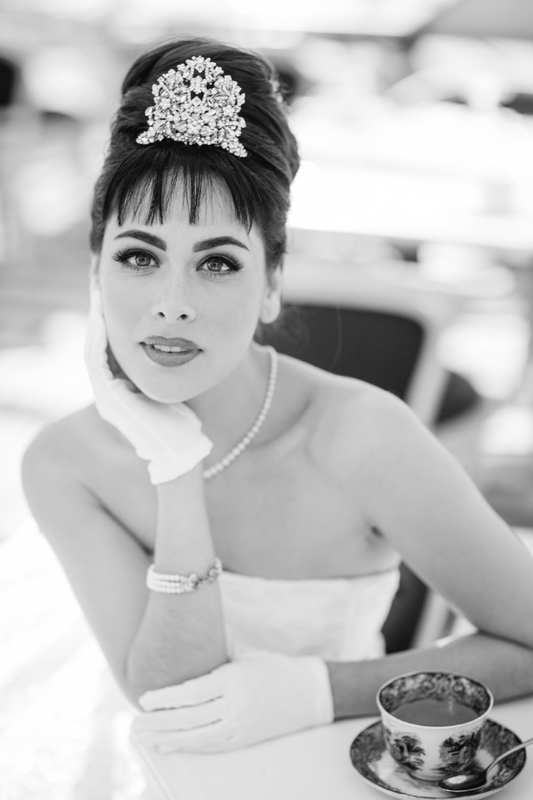 Denise turned to me for design inspiration and asked me to create my version of the tiara Audrey Hepburn wore as Holly Golightly in the movie Breakfast at Tiffany’s. The Blue Hen at the Adelphi Hotel was the perfect setting for the Tiffany’s brunch scene Denise envisioned. With its simplicity and elegance, this headpiece design was by far the favorite among all who took part in the photo shoot. It was the complete Audrey look! A Cartier necklace posed as Audrey’s headpiece in the 1968 movie Funny Girl. I couldn’t wait to create the headpiece fixed in my mind and turn it into a tangible beauty. This Audrey headpiece gave me the most amount of creative adrenaline. There is no stopping the design process once this occurs. Revisiting the 1964 film classic My Fair Lady to design a headpiece inspired by Eliza Doolittle’s graceful walk down the staircase before leaving for the Embassy Ball, was by no means a chore. I wanted my representation to be bold, regal, and stunning. I pictured Nina Jade descending the staircase in her silk gown made by Italian designer, Elisabetta Polignano, with utter perfection as though she was ready to dance all night. 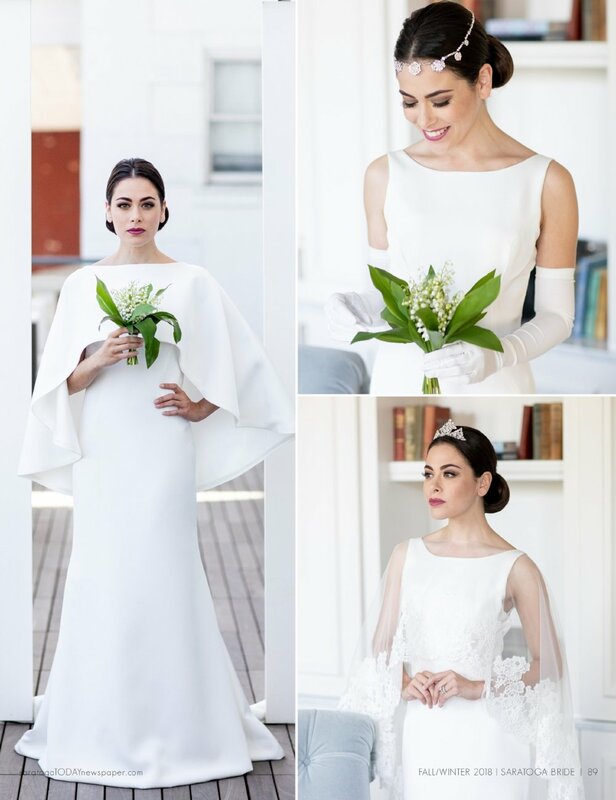 My final design for this shoot was not at all inspired by an Audrey Hepburn movie but by the royal wedding of Meghan Markle to Prince Harry. 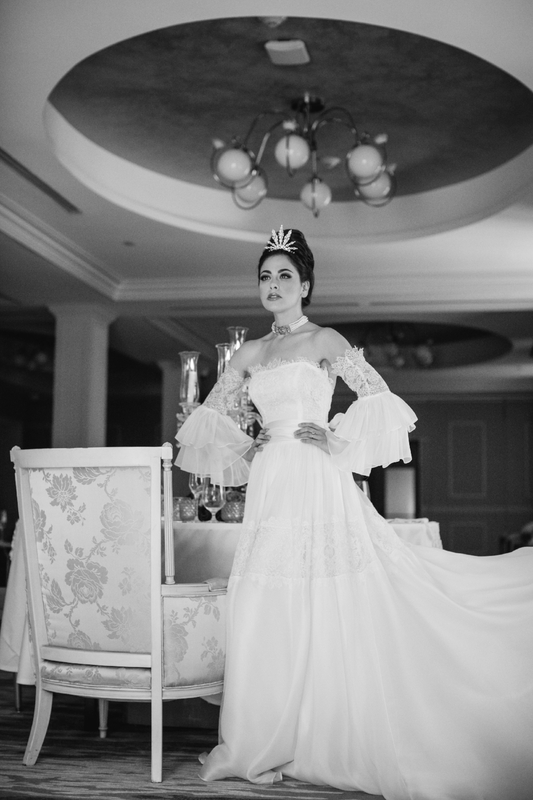 We could be made to believe the wedding gown designers who became a part of this fashion story were predestined by its author. Atelier Emelia Paris set the opening scene with this classic black and white pairing inspired by Chanel. Canadian designer, Lea-Ann Belter, was Denise’s preference for recreating the Audrey Hepburn cape-style Givenchy gown from the movie Funny Face. Much to Denise’s surprise, Lea-Ann Belter had just introduced her beautiful silk crepe Fiona gown and capelet to her newest collection. It was exactly what Denise was looking for! Switching to a sheer French lace cape gives a softer less structured look to the Fiona gown. I love it when a bride changes her look from ceremony to reception. Many brides decide to do this by buying a second dress. It’s so much more fun when you recreate yourself on your wedding day with an accessory change or two…or even three! Denise reached out to bridal merchandiser, fashion consultant, and friend, Iván Meza, to suggest the perfect gown for the final scene. He provided the exquisite “Laguna” gown from Italian designer, Elisabetta Polignano. With the photo shoot completed it was time for submission to Saratoga Bride Magazine. Denise hoped Editor in Chief, Chris Bushee, would see her vision just as she did. From real brides to destination photo shoots, Saratoga Bride magazine brings you behind the scenes in one of the hottest bridal markets in the northeast…Saratoga Springs! For this edition, we stepped into the past and created an 18-page feature reminiscent of Truman Capote's novel, Breakfast at Tiffany’s. 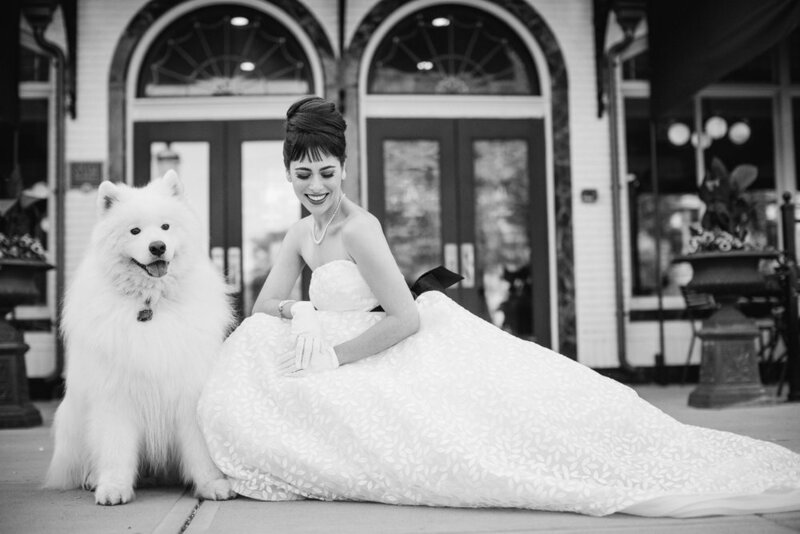 From our Audrey Hepburn look-a-like to a re-imagined turn of the century hotel, our team of contributors, writers, stylists, and photographers seamlessly merge the past with the present and clearly show why Saratoga Springs ranks among the best bridal markets in the country. 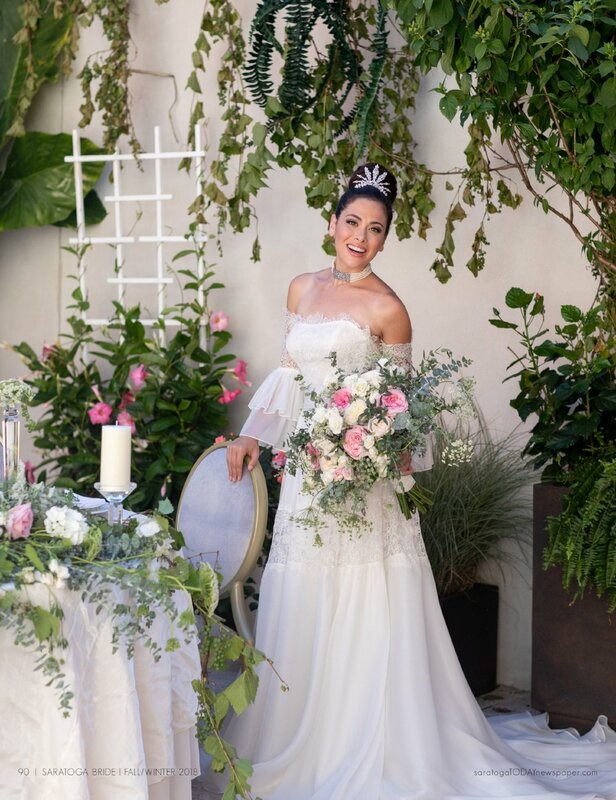 When Denise Eliopolis, of Something Bleu Bridal, came to me with her “vision” for the Adelphi shoot, I was enchanted! Having been a fan of both the original Adelphi and now the renovated version, this cover shoot was a dream project to work on! This project was a dream project! I spoke with Denise just last night, and we relished this collaboration. Each contributor was integral to the success of this photo story. If one part was missing the eventual outcome might have been vastly different. Many who have read this story in Saratoga Bride magazine have a true love and admiration for the golden age of romance and the classic beauty of Audrey Hepburn. Next month we will collaborate once again with some of the finest hair stylists, photographers, and make-up artists to give our followers a unique perspective on the bridal hair trial experience. Angela Cattaneo from Beyond the Ponytail will be with us to open our December blog. We look forward to seeing you back here on the Fourteenth!